In viral news which shouldn’t shock you, the singer who got a tattoo of Harry Styles on her cheek says it’s actually a fake, all staged in a PR stunt. 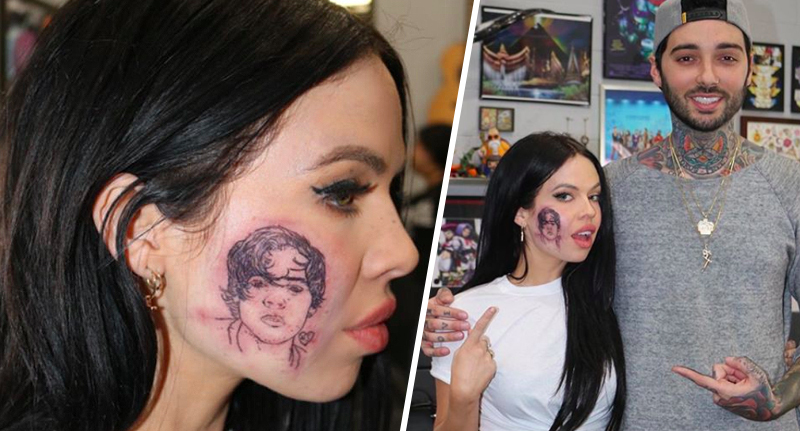 Kelsy Karter made headlines around the world when she shared the photo of her new face ink on Instagram. A lot of people interpreted the tattoo as the worst kind of ‘Stan’ culture – and ink artistry – and Kelsy quickly went viral. The singer, who hails from New Zealand, had tweeted to say that she was planning something special for Harry Styles’ birthday today (February 1) as he completes a quarter century of life. Well done Hazza. She even enlisted the help of a make-up artist and celebrity tattooist, Romeo Lacoste – who has previously tattooed the likes of Kendrick Lamar, Swae Lee and Justin Bieber – to make it look real (read: really, really bad). She’s now admitted it was a stunt to publicise her latest single, which is about the former One Direction singer. To be fair, tattoo aside, the song alone is lyrically alarming enough to be a rather unwelcome birthday gift for Styles. Harry, I’m gonna make you love me. You gonna make me breakfast. It’s a secret just between us. We can keep it low-key. I ain’t being funny. You should be so lucky, to put your velvet arms around me. The song is accompanied by a video which Kelsy says she directed, produced and edited for just $300 (£229) – and you have to admit the hustle is real with this one, even if the tattoo isn’t. In the video, the viral star explains she was going through a bad break up in 2018 and she lost her little dog, Diva. She says she was sick of writing sad songs – something I’m sure Harry himself can relate to on a profound level since the release of Sign of the Times – so instead Kelsy decided to write about Harry Styles. Just goes to show the lengths young artists have to go to make it in the music business… Or how far fans are willing to push pranks to get noticed by their superstar crushes – after all, we live in a time where this was momentarily believable. Either we’re all gullible idiots or Stan culture has reached peak toxic. BTW, we know it looked ridiculous. That was the point. The tattoo has gone. All that’s left is the music, which is what my rockstar team and I had planned all along. Rockstar team aside, here’s betting her mum is just really relieved the tat was only a temporary trick.